John joined the World Traders’ Company on 1 July 1992 having been introduced by Lord Denman. He was clothed as a liveryman on March 16, 2000, having received the Freedom of the Company on 10 September 10, and the Freedom of the City of London on 2 February 1994. He received his education at Nelson College in New Zealand and has three children, Richard, Caroline and Susan who are all married. 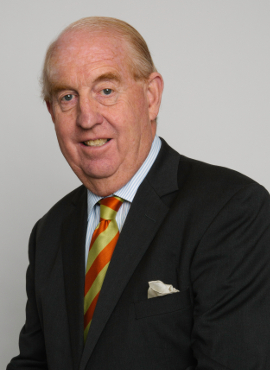 John’s roles have included Executive Vice Chairman, Amlin plc; Non-Executive Director of Edward Lumley Holdings Limited and Frontiers Group Limited; Chairman Lloyd’s Charities Trust; Past Deputy Chairman at Lloyd’s of London and Lloyd’s Market Board. He is a Past Member Lloyd’s Regulatory Board and Past Chairman of Lloyd’s Members Services Unit. His voluntary Activities: Trustee, The Tank Museum, Bovington; Chairman, Fundraising Board, Tank Museum; Deputy Chairman, The LINK Foundation for UK New Zealand relations. John is a Member of the City of London Club; Burnham and Berrow Golf Club; The Wellington Club, New Zealand; the Wellington Golf Club, New Zealand; Steenberg Golf Club, Cape Town, South Africa; Somerset County Cricket Club. He enjoys farming and has raised Pedigree Herefords in Somerset.